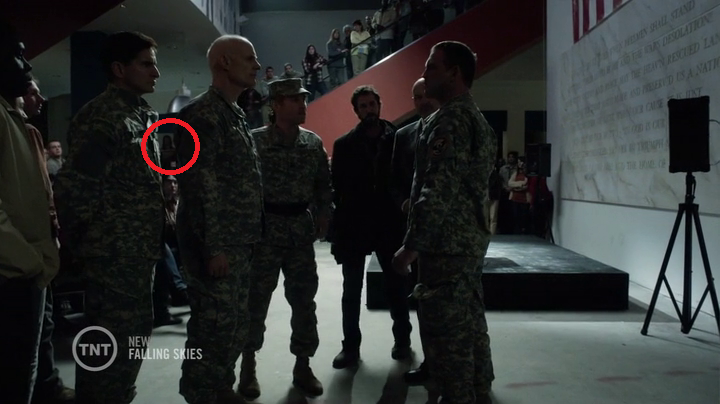 Haha, he was on the episode of Fallen Skies that I did, and I was in one of his scenes...way across the room, but I was there! That's me circled and that's Ty in uniform on the right playing Sgt. Clemmons. You need to get him to autograph this pic at Vancon! ... And obviously only when you have the time and interest: How's about a post of "Six Degrees of Kevin Bacon" with YOU? I just would find it funny. Well, according to the Bacon Oracle, Ty Olsson has a Bacon number of 2, which would make mine 3...but I've "acted" with more people than just Ty...so... Noah Wyle has a Bacon number of 1, which would actually make my Bacon Number 2 then! We are watching Defying Gravity now, and my husband just recognized him, which threw me for a loop! Haha, yes, I think I really made the scene!